Finally managed to complete the game (Aug. 9, 2017): Demise of Nations, a wargame covering the rise of Rome till the fall of modern civilization. Just took severl years. Technically the game is built on top of libgdx. It also uses various 3rd party libraries including LWJGL and PuppyGame's Steam library amongst others. My thanks go out to all those folks. It looks really impressive! I remember a couple of your other games, and they do have a certain aesthetic about them. Are you developing it alone, or in a team? Can't help but think that 'demise of nations' will be about a game where your own nation / army will eventually lose. Looks very good! I would love to play this! Wow, that's a lot of responses. As I said, it's a turn-based strategy game, so don't tell me I didn't warn you all! re-development: I work together with an artist and a scenario modder. Generally, I outsource graphics & music. I do all the programming and design. Programming is fine, but I am worried about game-play design. I enjoy programming but making it a "fun" game is a challenge. I am still about 2 months away from giving out the game for play-testing. I need to add the AI first. re-name: yes, "Demise of Nations" might be little dark. Any suggestions? Textures are nicely worked and the whole thing is really coherent! Waiting for something playable. How will be the fighting-system? There won't be a real-time fighting system such as in Total War. Maybe the rest somewhat resembles Total War (strategical overview map part). You have different units at your disposal each with their corresponding strengths & weaknesses. A spearman would for example be stronger than a horseman etc. Please share the play-test version!! This is not entirely correct, the salad was named by a dude which was named after the dude you are referring to. Give a man a fire and he is warm for a day, set a man on fire and he is warm for the rest of his live. No worries, Neapolis is going to stay safe! You could add a turn based combat-system like it's used in heroes: http://en.wikipedia.org/wiki/Heroes_of_Might_and_Magic. If you would add some strategical attack/defense-values it would perfectly fit, but maybe that's just me. It took a while, but I finally managed to get the ALPHA-release ready! Re: Demise of Nations (turn-based strategy) - NOW on Steam! 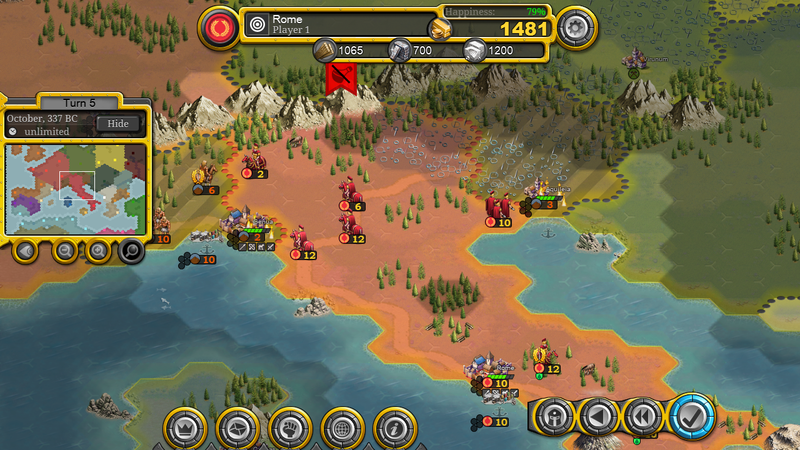 As of April 22, Demise of Nations is finally released as ALPHA/Early Access on Steam. This has taken forever. From the 1st public ALPHA release (February 2014), the game is not officially released after 3.5 years in ALPHA. It's available for PC, Mac, Linux, iOS and Android. Auxlia? Don't you mean Auxilia? Oh never mind, looks like you might be correct; silly Latin. I think everything helps - Thanks! Although I mainly follow other developers, there are quite a few players that I am being followed which is nice. Marketing seems to get harder I have to say. Sending out press copies and stuff hardly gets any responses besides them asking to advertise. I guess it's also possible the game isn't that good. Anyhow, I guess cross-advertising the game in other games I developed, twitter & facebook seems to get the most responses. Thanks. Not sure about it being polished enough just yet. Somehow I feel game-play is there, but is lacking something. Can't quite pinpoint it.